Emma Roddy won best van. It was even equipped with ….. choc biscuits! 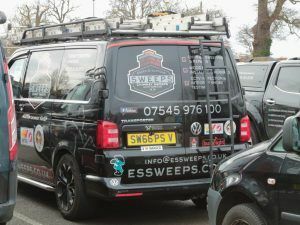 GONE are the days when a local chimney sweep would be seen cantering across town in a horse-and-cart or whistling on a bike with his brushes. The modern-day chimney sweep’s chariot for battling soot is his or her workvan. And the vans on display for the Guild trade show’s best van competition this year were simply superb. The competition is open to any sweep and this year there was a record 18 entries. 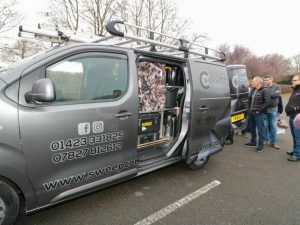 Steven Howard, event organiser and technical director for the Guild, was particularly impressed at the vehicles on show. 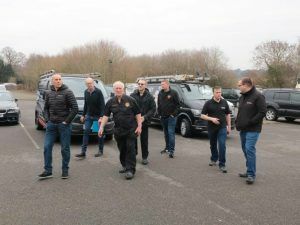 “Beautiful vans there,” he was heard to comment as he swept back to the exhibition hall to see the many visitors to the recent 2019 event. 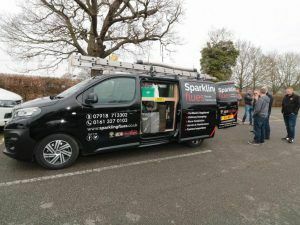 Emma Roddy, of Sparkling Flues in Manchester, was overall winner of the best van competition, driving away with a smart trophy and £250 tucked in her pocket. She said: “I was very pleased and shocked to win the competition as we hadn’t really planned to enter it. I had checked into the hotel and returned to the van to collect my bags, etc. 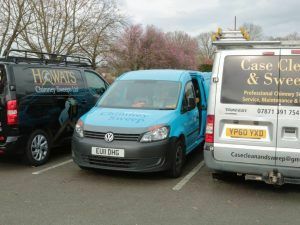 Emma believes it is of the ‘utmost importance’ to have a ‘well-equipped, clean and tidy van’. Emma said she preferred to be well-organised and a secret box of choc biscuits was a vital part of her kit – to be chomped in an emergency. Her van has also helped in her work training new members of the Guild. Runner-up this year was Thomas Wiggins, from Commercial Chimney Sweeping Ltd in York, who was awarded £100 and an engraved glass tankard. Thomas said: “Katie [my wife] and I had a great weekend at the Guild exhibition, made even better after walking away with the runner up prize for the van of the year competition. 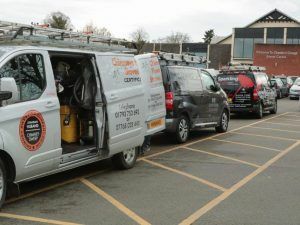 It was great to see some brilliant vans, and how sweeps make the best use of the space available to them. Katie Wiggins enjoyed spending time viewing other sweeps’ vans. She confessed she wasn’t a Guild member but she is a sweep and felt most welcome at the show. She called the vans on display ‘fantastic’. 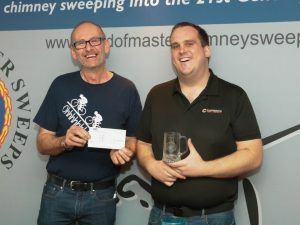 Last year’s winner David Barrott, who runs Hygienic Chimney Service based in Harrogate, was the judge this year, alongside Guild Training director, Dave Wooffindin. 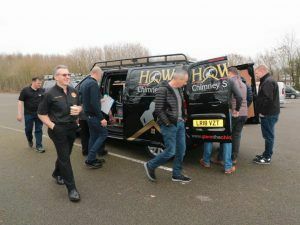 David Barrott said the judges didn’t have a ticklist, as such, but scrutinised aspects such as the general look of the van, whether it was clean and tidy, if there was a good range of equipment such as for power or manual sweeping, etc. He added: “It was a very, very high standard and they were all very, very good. 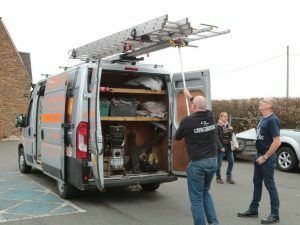 Emma’s van was particularly pristine with a fire extinguisher, first aid kit and a vast amount of equipment. It was a hard decision between Emma and Thomas”. 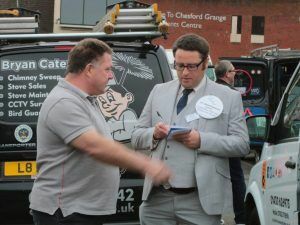 Judge David Wooffindin was equally impressed by the professional look of sweeps’ vans seen over the two days of the Guild trade exhibition. He said: “The quality of the entries this year was truly outstanding and, although the competition is a bit of fun, it was a testimony to the professionalism of all those who entered”. 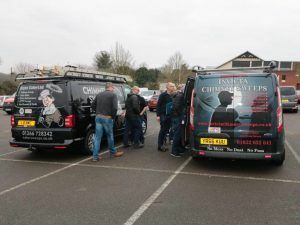 Graham Sell, of GR Sweeps in Ilminster, was ‘hand on heart’ not nervous as fellow sweeps perused the inside of his strikingly blue van. 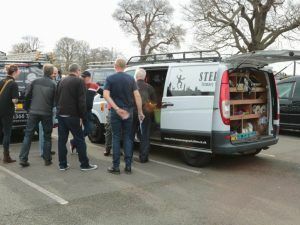 Graham gave a meticulous tour of the inside of his van, showing a clear logic in its presentation. He had a ‘clean section’ with dust sheets, etc, behind the front passenger seat, which is easy-to-access and the other side, behind the driver’s seat was full of tools. The brushes and gear needed for grubby work was kept in the back. 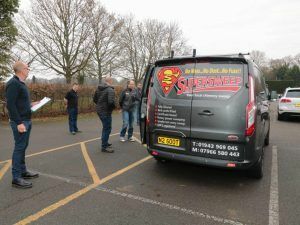 Sports enthusiast Kevin O’Brien runs 5 Star Chimney Sweeping and Gutter Cleaning Services in Coalville, Leicestershire. 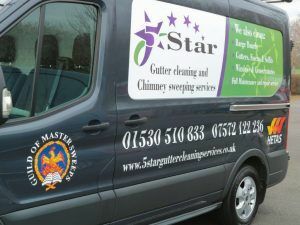 He uses a large Ford Transit van, necessary because he combines both professions of sweeping and gutter cleaning. It means he needs plenty of space for the various equipment, which was neatly stored. 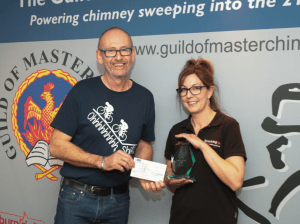 Congratulations to Emma, Thomas and all entrants – we look forward to seeing more cracking vans at the Guild of Master Chimney Sweeps Trade Exhibition in 2020!